3rd party or network changes. no UPnP/STUN/ICE required, no spoofing, and no DNS tricks. port decided by the server. Researched and developed by Samy Kamkar. Daniel Meekins, udptunnel, and my original chownat. and potentially Windows via cygwin. Tested on Linux and OS X.
Ok, so does this really work? I'm confused. This can't work. You should be, and it does work. But it can't. My NAT blocks incoming packets and so will the other. Great question! I thought you'd never ask. Look below at HOW DOES IT WORK? Does this use DNS for anything? Do I need to setup port forwarding or a DMZ on either end? the two NATs at any point? No. The connection is entirely direct, client to server. Will this work behind my corporate NAT and firewall? This will work behind many NATs and firewalls, but not all. What uses does this have? What if one or both ends aren't behind a NAT? payload over UDP if you wish; no NATs are necessary. Does the server have to specify the client host? attempts to connect, penetrating the NAT using this unique method. My method of penetrating NATs is two-fold which I will describe below. the public IP address of the client. until the client connects, and NATs will normally drop unknown incoming packets. penetrate the NAT exploiting the stateful translation tables. includes the "original" fixed packet that the server was sending to 3.3.3.3.
and acts as an identifier for pwnat. client, thus allowing the server to know what the client IP address is! client on your network, based off of the data inside the ICMP time exceeded packet. same method used in my previous software, chownat, to penetrate both NATs. Machine A sends a UDP packet to quake server, opening a "session". I'm routing it to machine A." able to communicate without any problem. 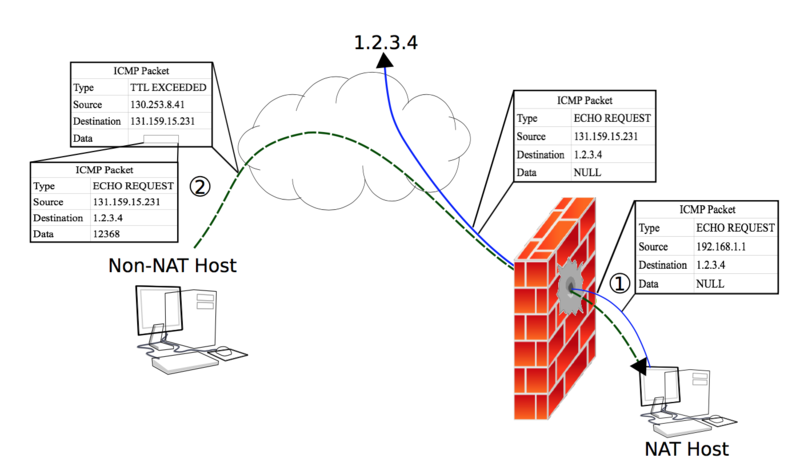 Now here is how pwnat works now that client and server know each others IP. drops every one of them. Machine B does not stop. ports to 2222. Any unprivileged user can set UDP source and dest ports. Normally the UDP packets that machine A is sending to NAT B would get dropped. the packets coming back to the NAT look like responses to the ones going out. run over TCP to tunnel through. keep-alive packets will be transmitted. Then, browse to http://localhost:8000 to visit the google! Questions, fan or hate mail, email me: samy@samy.pl. Also visit https://samy.pl for more awesome stuff.